The air was thick and moist on this first hot day in New York City. Anticipation ran rampant as I spied those familiar flowing, caramel locks chilling at a sidewalk cafe. That was surely Noam Sienna, my most favorite henna historian ever! We were on a tight time schedule and rushed to get the express train out to Brooklyn. Feeling the crunch of time we started the interview as we swiped our Metrocards and got on the A train. The interview continued until we walked into my apartment. Fearing that I wouldn’t capture every word he uttered I got the mic set up, did some testing of the sound and we were off! Two hours later and only a handful of subjects covered–along with a lot of really fascinating tangents–we wrapped up. Quick hugs and then we were off to our other appointments, mine with my trainer, Noam’s with the sun. Noam Sienna is a professional henna artist and has been practicing and researching henna for six years. 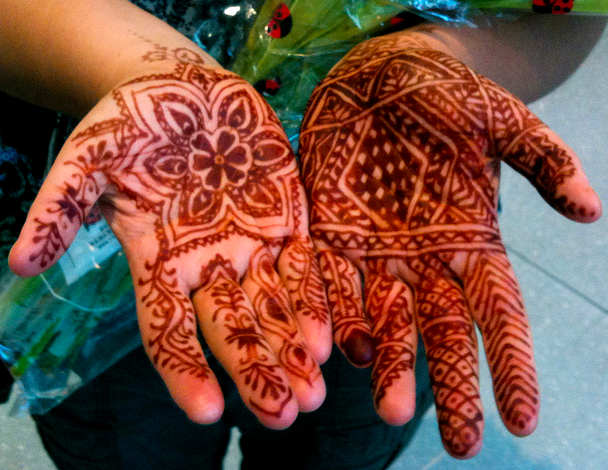 Growing up in an Ashkenazi Jewish family, in college he discovered that Jewish communities had henna traditions as well. After a year in Israel researching Jewish henna ceremonies in contemporary Israeli culture, he analyzed the survival and revival of Jewish henna in his undergraduate thesis, “Old Patterns, New Skin: Jewish Henna Ceremonies and the Politics of Heritage”, for which he received highest honours in Anthropology. 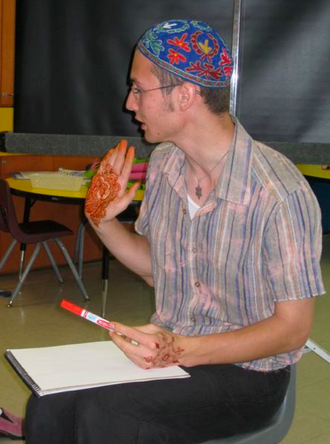 He has presented about henna traditions across the world, and is continuing his research on Jewish henna in the Department for the Study of Religion at the University of Toronto. He describes himself as a Jewish henna artist, researcher, and ritual facilitator, and is thrilled to see how contemporary Jews are using henna, and henna traditions, to create meaningful rituals and ceremonies in their lives. You can find out more about Noam’s work and get an excellent dose of henna history at his website HennabySienna.com. In the meantime stay tuned for future episodes with Noam; we promised each other that we would continue the conversation soon and in front of the mic. Enjoy!